In this exercise we will learn how to control your pace in 1500 m.
when you know you are going to swim this distance you have to be ready mentally, physically and most important to know exactly how to start your first 200m, and how you are going to finish. 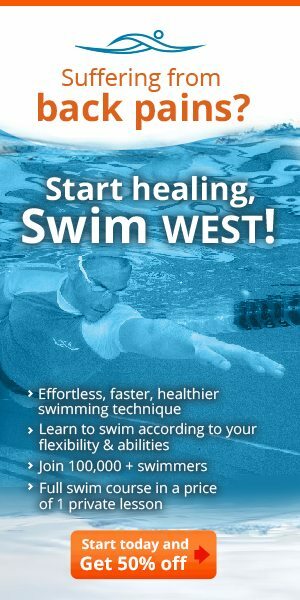 In long distances the depth of the glide in WEST swimming technique is very important, try this workout 2 times and learn why. first 50, very fast, 2nd 50 count strokes, 100 slow. The most important thing in the drill is to count strokes in the first 100 and to know the difference between the first & the second 50. *after each 200 rest 20 sec. If you are very flexible in the end of the glide bring the shoulder to your cheek in if you are less flexible glide deeper and touch your chin. 20 sec rest after each 50 m. In this exercise we will swim the same number of strokes in all 4X50 but we will swim 2 sec faster from 50 to 50. 4 2X100 on 2:30 send of time 85% It is important to swim fast in the same number of strokes like the last exercise. 2nd- faster, 3rd- exactly like the first one,4th- faster then the 2nd, 5th like the first, last one all out. 250 allout your goal is to swim 3-5 sec faster than the fastest one in the last exercise.